Do you have a “foodie” in your life? 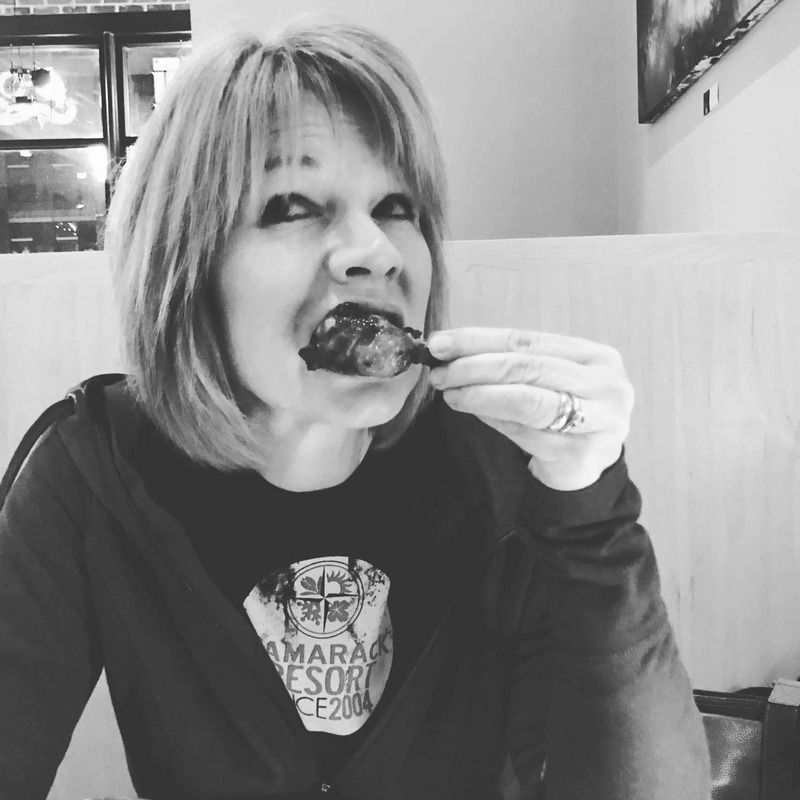 Trust me … you have all kinds of “foodies” in your life. Whether it’s the gadget-loving chef or the tailgate-grazing sports fan or the I-don’t-turn-on-a-stove-but-I’ll-eat-anything-you-put-in-front-of-me consumer, everyone is a “foodie” at some level. The beauty of this? It makes choosing a perfect gift simple and personal! All year-long, we have occasions that call for a gift (birthdays, weddings, graduations, Christmas, etc.) or token of appreciation (hostess gift, party favor, etc.). Food is a universal language and can (and should) be customized for the receiver of the gift. 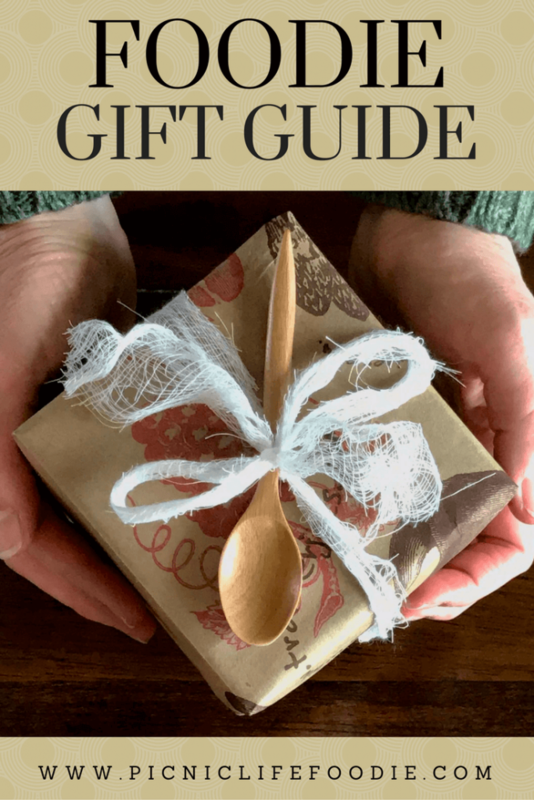 Since I started this blog, I have explored food-related markets, venues, restaurants, and resources and as I discovered new things, I would often think, “so-and-so would LOVE this” or “I should tell so-and-so about this.” Quickly, I started incorporating these “finds” into gifts. 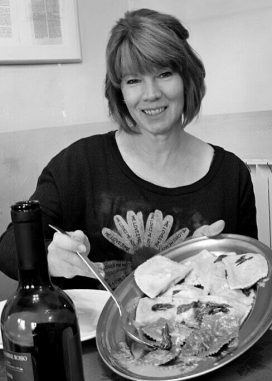 As long as I took into consideration the type of “foodie” the receiver was, it was not only appreciated but also unique. At the risk of sounding like Oprah, I decided to put together a list of my favorite things from 2017. Don’t bother looking under your chair … no one’s getting a new car … but sometimes fresh ideas are just as generous. This list includes a lot of products made here in Iowa, or have a special tie to Iowa. 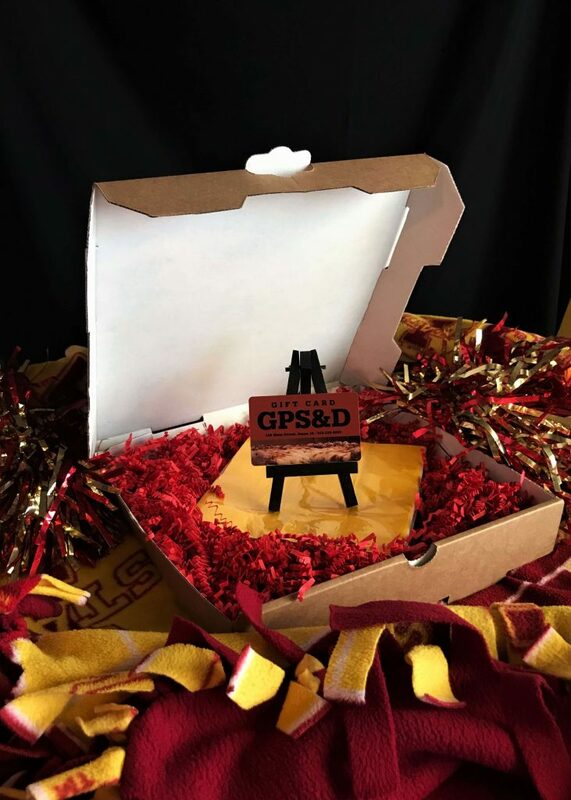 These items are and should be customized to fit the person receiving the gift. Look for similar items that are local to them or personalized for their tastes and interests. 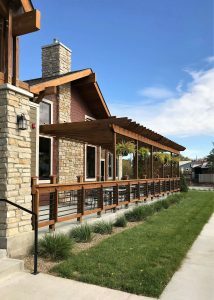 “Shop Local” is a key phrase these days and whether the location of the “shop” is in the country, or main street of a small town, or in the heart of a big city, people like things that have a tie to their community. Giving a community-based gift shows you care not only about the recipient but also about supporting that person’s “local” businesses. Here are some of my favorite “local” food items. Herbs are big-time foodie news. No, they aren’t new to the foodie arena but they are being used more creatively than ever. The sweetness of desserts is balanced by the earthy and floral notes of herbs. Olive oils and balsamic vinegars are infused with flavor combinations of herbs, spices and citrus. The medicinal properties of herbs are incorporated into lotions, soaps, and fragrances. 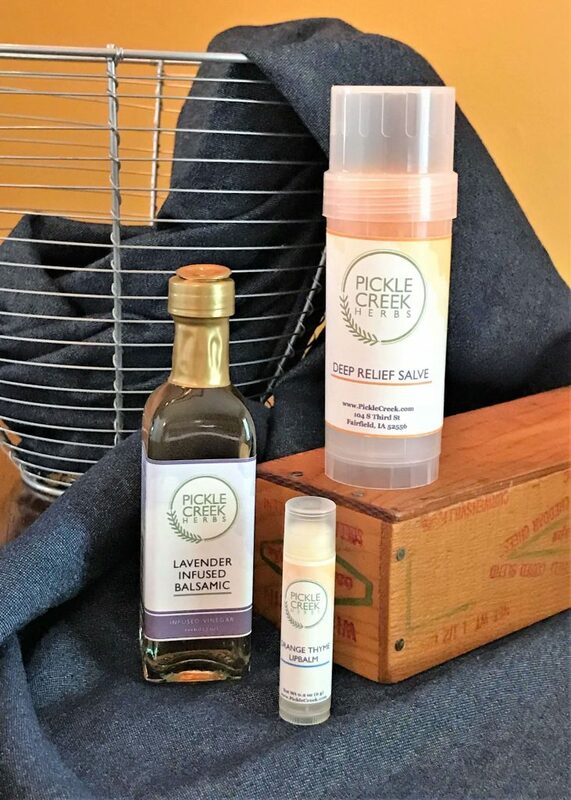 I highly recommend the products made by Pickle Creek Herbs in Fairfield, Iowa. I am a sucker for free samples at the farmers’ market and became intrigued at the Pickle Creek tent when I saw Lavender Infused Balsamic Vinegar among many other vinegars and oils. It’s light and fresh and I later discovered it is delicious on fresh tomatoes, sliced watermelon, salads, and sandwiches. Tim and Jocelyn also make soaps, lip balms, and skin salves. The Deep Relief Salve combines almond oil, beeswax, comfrey root, cayenne pepper, peppermint essential oil, and vitamin E to sooth and relax sore muscles. I love the light fragrance and the lack of oiliness in this product … not to mention that “soothing sore muscles” part! If you know an avid gardener or gardener-in-training, you might consider their Gardener’s Skin-Soothing Salve (and check out the Herb Garden Starter Kit below). UNDER $20: A great gift idea from their site is the customizable Gift Box which contains 4 2-ounce bottles of olive oils and/or balsamic vinegar and you choose which four you want! They also include recipes with purchase. Shipping is free for orders over $50. 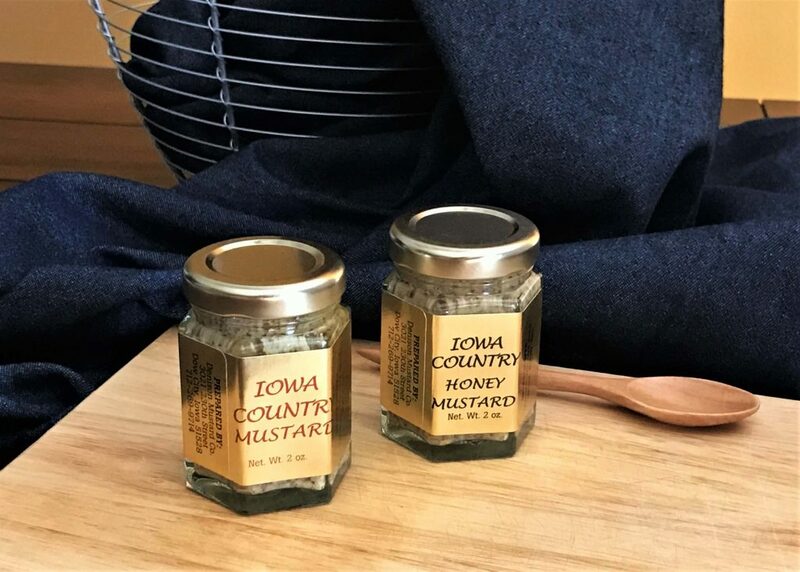 Another farmers’ market find, the Denison Mustard Company … yes, they had samples … has earned a place in my cupboard/refrigerator. These mustards are made in … nope … not Denison … Dow City, Iowa. Although the company has moved around over the years, it has called Crawford County, Iowa, home since 1885. It may be the fact that this company was founded by a German Immigrant (hint: it pays to know the heritage of the gift receiver), but I think my attraction to this product was my first taste of their Country Dill Mustard … amazing! IDEA: Pair a couple of these mustards with a bag of pretzels and a 6-pack or growler of craft beer from a local brewery! While we are visiting the western side of the state of Iowa, I must point you to Wall Lake, Iowa, where Cookies BBQ Sauces are produced. 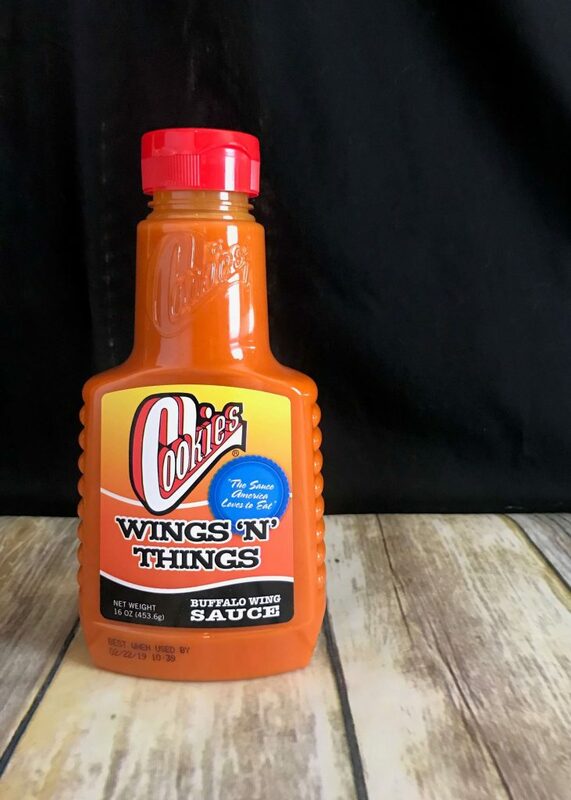 Although I like their BBQ sauces, I am absolutely hooked on their Wings ‘N’ Things Sauce. If you have a hot-wing-lover on your list, this is the gift that will win you a big ol’ sticky finger hug. It has perfect heat, and by that I mean the more you eat, the more your mouth burns. But don’t be deterred by this … if you want it less spicy, dilute it with one of their BBQ sauces or sweeten it with honey. We frequently mix it with Ranch dressing for a dip for chicken strips or veggies. This product is available in most Iowa grocery stores or can be ordered from their website. It must be good because you can also order it on Amazon … but only if you want quantity because it’s sold in 70 ounce bottles. That’s a lot of wings! 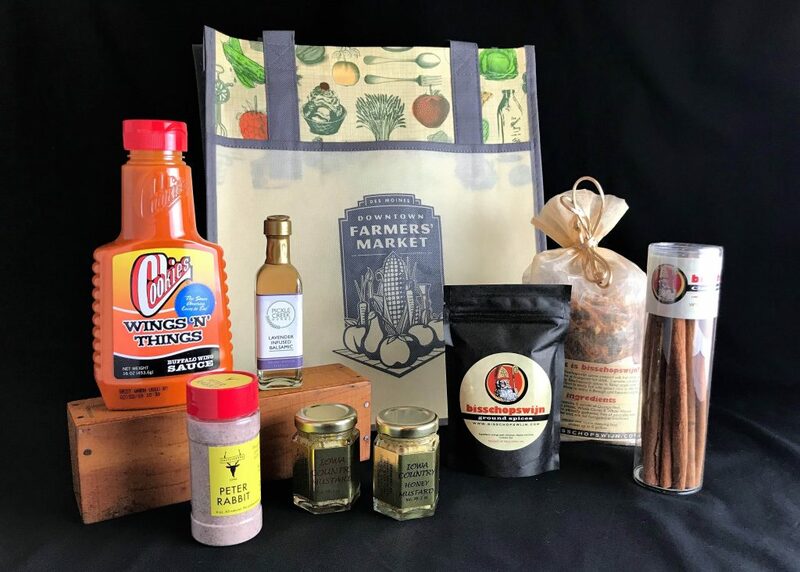 Moving over to Nevada (pronounced ne-vay-dah) in central Iowa, is a company making artisanal herb and spice infused seasoning blends: Saltlickers. 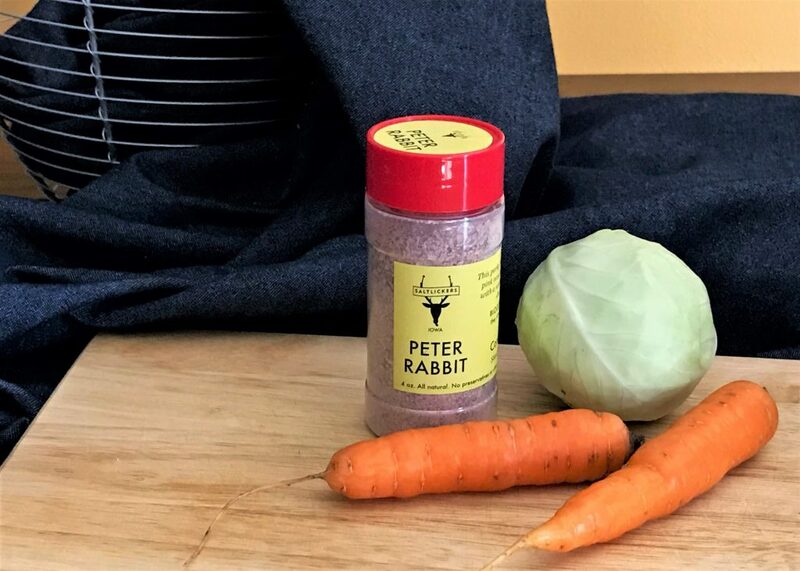 My personal favorite is the Peter Rabbit … a salt blend with highlights of radishes and dill. Sprinkled on fresh veggies like carrots, celery, bell peppers and cauliflower … who needs dip! I am also quite infatuated with their Wassamatterhorn which is a blend of sea salt, rosemary, and juniper berries. It is a perfect blend for sweet potatoes or squash and I hope to use it to season the pheasant our bird dog better find this season. IDEA: Check out their website for gift boxes or custom blends! 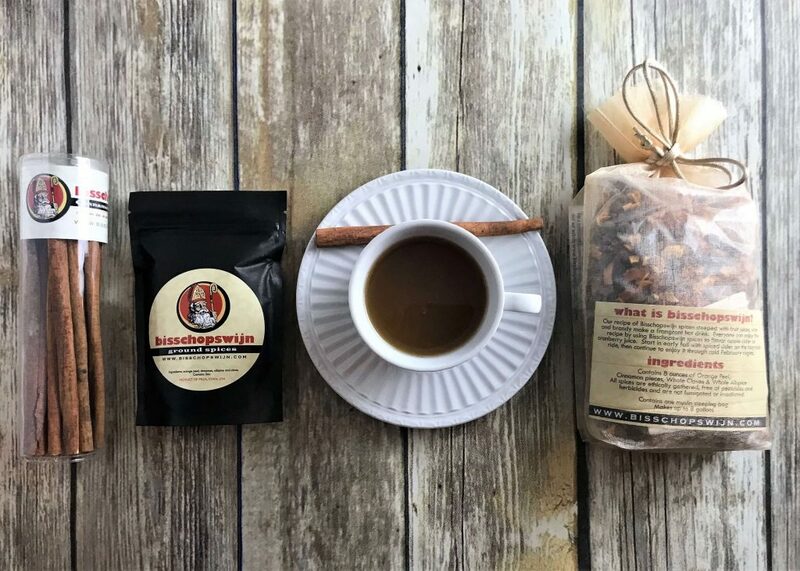 Just in time for this blog, I came across Bisschopswijn Mulling Spices on my final trip to the farmers’ market. 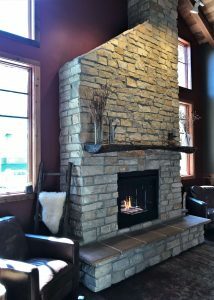 I had never crossed paths with this company before and quickly learned that this Pella, Iowa based company has a big following. It is a Dutch tradition for “families to sip Bisschopswijn (Bishop’s Wine) as they await the arrival of the good saint”, Sinterklaas … think Miracle on 34th Street! The mulling spices can be used to spice cider or cranberry juice, mulled wine, and even desserts. There are recipes for alcoholic and non-alcoholic drinks on their site that will warm any Thanksgiving, Christmas, New Year’s, or winter celebration. IDEA: If you are looking for a unique hostess or grab bag gift, package the mulling spices with a bottle of rum or cranberry juice and some pretty napkins. Or for a festive party favor, buy a big bag of the mulling spices and make individual steeping bags out of cheesecloth tied with kitchen-string and a small cinnamon stick! One of the first things we learn about another person is their allegiance to a college or professional team. It may be where they went to school or it may be a team they’ve cheered for and cried with since childhood. Maybe it’s a place they know very little about but is about to become home as they begin school or a job in a new location. Want to think outside the t-shirt box? Art is not an easy thing to choose for another person; however, when you choose a simple piece that represents something the person loves you can’t go wrong. This 12″x18″ print from Modern Map Art, placed in a simple frame, is more than something to hang on a wall or prop on a shelf. It is a map of memories or a first impression on a new adventure. How is this a “foodie” gift? Imagine this as a graduation present for a student headed off to the best university in the world (as pictured), or any number of other schools, but with color-coded or numbers dots on the clear covering for points of interest like iconic restaurants, movie theaters, football stadiums, shopping malls, grocery stores, etc. Want to take it another step? Include a gift certificate and menu from one of the restaurants to get them acclimated quickly! A lot of people do not like giving gift certificates because they feel it’s too impersonal. They are only impersonal if personality isn’t added to the gift card. Here’s a great example of something that could easily be added to the map art shown above: a gift card to a favorite, local restaurant. 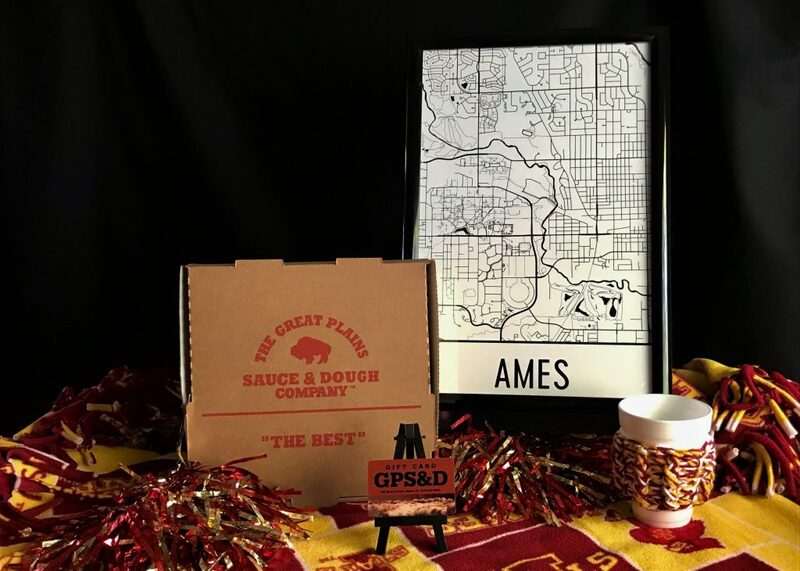 One of my all-time favorite pizza places in Ames, Iowa, Great Plains Sauce and Dough Company , has been serving amazing pizza since I was in college (now that’s longevity). What makes them unique is not only the nostalgic atmosphere of the restaurant but the variety of crusts available … the Denver (a wheat dough with hand-rolled edges that you finish off with honey like a breadstick … do NOT knock it til you try it) is my personal recommendation! Wrap the gift card in a pizza box with a take-out menu (both of which the restaurant will almost always provide at no charge), some napkins and filler to make it colorful, and you’ve got personality. Remember that “tailgate-grazing sports fan” I referred to earlier? Koozies keep their “beverages” cold on a hot day and Cozies keep them hot on the cold days. I found this hand-knitted cozie at The Market Place (Manning, Iowa) and thought it would make a great grab bag gift or stocking stuffer! 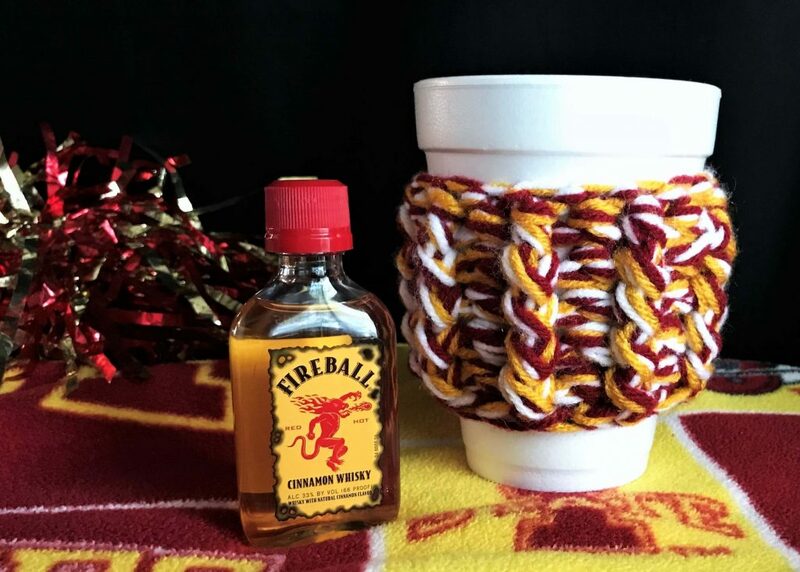 IDEA: Fill the cup with a bag of homemade snack mix and a little (or big) bottle of the tailgate beverage of choice (cue Florida Georgia Line please), and a small gift evokes a big feeling of good times! 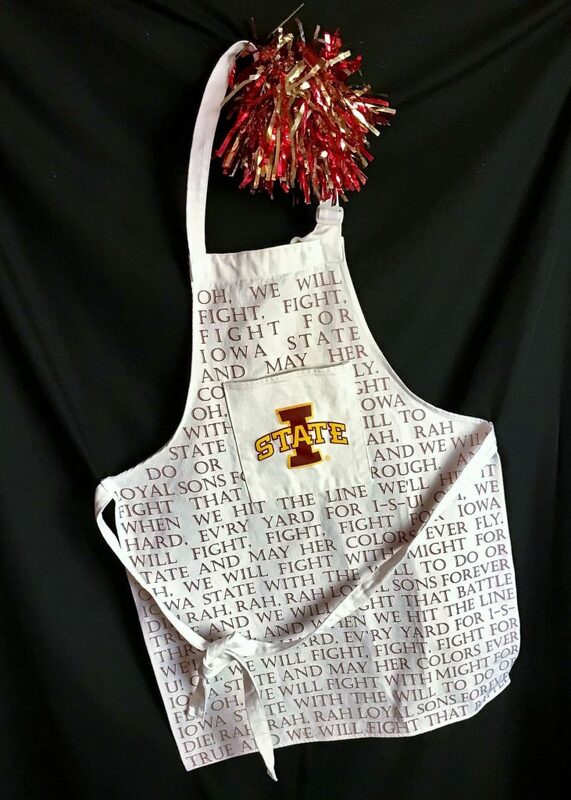 Aprons are the perfect gift for that person who is equally infatuated with cooking/grilling and a team. I know a couple guys who would happily stand guard over a grill for hours making food for other people. If they can sport their team colors and keep the inevitable splatters of the grill off their clothes, it’s all good. IDEA: Wrap up an apron with some new grilling utensils, grill seasonings or sauces, and/or a new color-coordinating cooler. Food is inspiring. It is relatable and uplifting. We talk over coffee. Our mood can change over a scent. The gift of food can say what cannot be put into words. Receiving a gift that “gives back” is twice the gift. Here are a few ideas of how to give a gift that feeds the soul. This book was given to me earlier this year by a good friend and I have shared it with many friends since then. 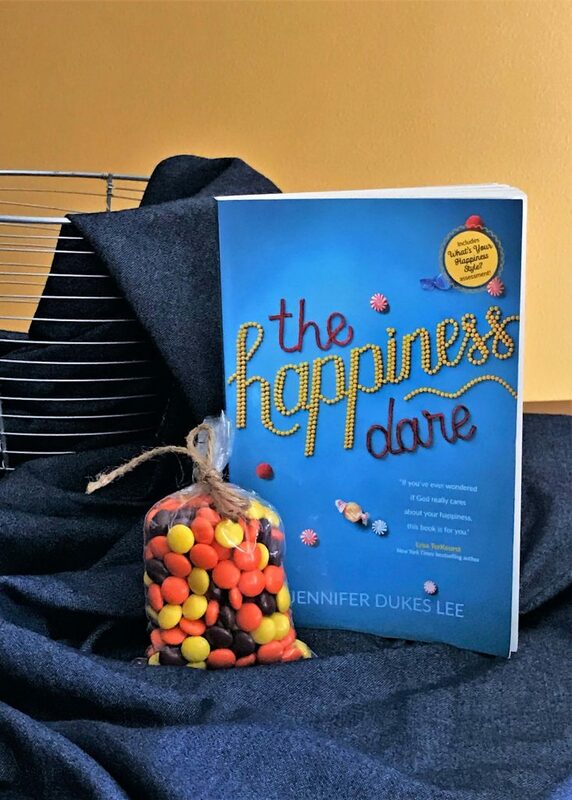 It is written by Jennifer Dukes Lee, a NW Iowa Christian writer, blogger, and speaker, and provides a journey to find your personal “happiness style”. Are you a Giver, a Doer, a Thinker, a Relater, or an Experiencer? Maybe a combination of several or all of these? Jennifer helps you identify your style and helps you understand why God made you, and everyone around you, to be happy in this way. It’s a little hard to see in this picture, but the words on the cover are formed out of candy. Why? That’s for you to find out … and to share with others! It’s inspiring, it’s funny, it’s helpful on many levels, and it’s full of good reminders of just how special you, and your gift recipient, are. IDEA: Wrap up this book with a bag of your recipient’s favorite candy, a sweet treat from a local candy store, or a few pieces of homemade fudge. I love gifts that give back: when you buy something from an organization and the proceeds go to support that organization or another organization in need. This type of gift can be perfect for the “I don’t need anything” person. And the truth is, they probably don’t but you want them to know you care. Over the past few years, I have become acquainted with an organization here in Des Moines called “Freedom for Youth“. This organization provides faith ministry, education assistance, job training, and a safe environment for before- and after-school and weekend activities to youth and young-adults in Des Moines and a growing number of communities across Iowa. 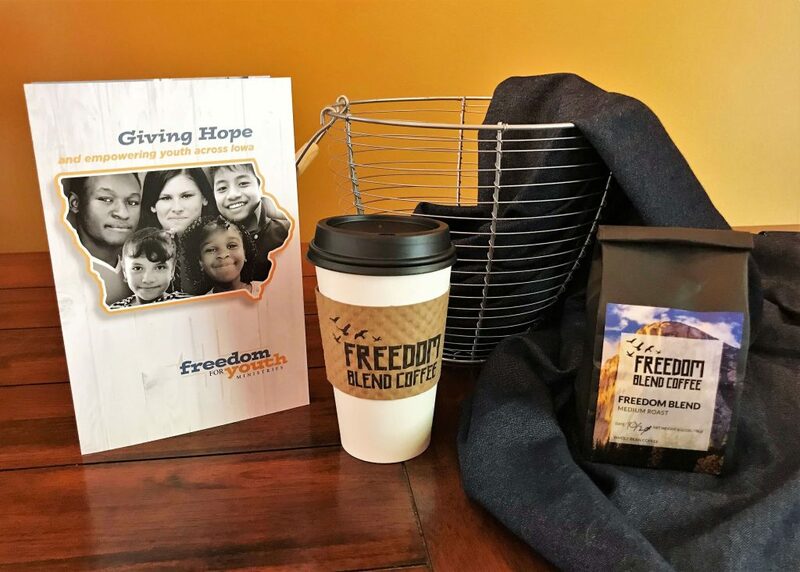 One of their programs is the Freedom Blend Coffee shop which is operated by young adults within this organization. They sell and serve fair-trade coffee that is roasted and packaged on site, as well as breakfast and lunch items. Can you believe this place started out as an abandoned car wash? This transformation has lifted an entire community! IDEA: In the Des Moines area? Stop by the coffee shop and purchase some of their coffee beans, get yourself a latte, and pick up a donation form and brochure. Enjoy your latte. Wrap up the coffee beans (maybe with an inspirational or personalized mug) and a card that says you’ve made a donation to this organization in honor of the recipient. Don’t forget to include the brochure so the recipient can read all about the good efforts of the organization while they sip their coffee. Not in the area? There are organizations like this EVERYWHERE. Check with your church or school. Google is your friend. Or seek out an organization that has a special place in the recipient’s heart and find a way to combine a donation with a small, but related, gift. The sense of smell is a powerful thing. It evokes memories, lifts spirits, and makes stomachs growl. There are many options for gifting in this area: candles, essential oils and diffusers, lotions, and hand soaps. The trend right now is natural ingredients with a focus on herbs, spices, and citrus elements like geranium, basil, rhubarb, rosemary, grapefruit, chai or white tea, and juniper. 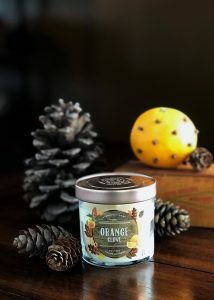 The ageless combination of orange and clove is popular again and my recommendation for fall and winter. This little candle came from Target for $5. IDEA: An all-natural, inexpensive way to provide aromatherapy in your home is to add citrus peel (orange, lemon, grapefruit) and spice (whole clove, juniper, all spice, cinnamon) and herbs (rosemary, thyme, sage) to boiling water on the stove and simmer for 15 minutes at a time. You must watch carefully as the water will evaporate over time … add more water as needed to continue the scent. What would a gift giving blog for foodies be without a cookbook recommendation? Technically, this book was never meant to be a “cookbook” according to the author, Samin Nosrat. 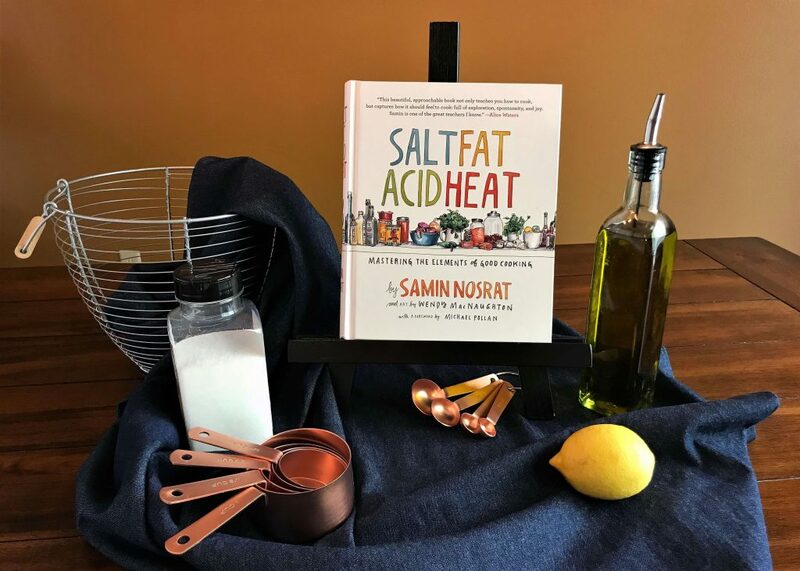 Salt Fat Acid Heat was written to be a “how to cook” book, not a recipe book. Samin discovered that no publisher wanted to get behind a cookbook without recipes. In the end, she did add recipes as a vehicle to learning to cook without recipes. This book is beautiful, funny, easy to read, and so instructive. I have learned a great deal from this book about these elements of cooking and how to cook from instinct and senses … smell, touch, sound, and, of course, taste. It is the perfect gift for cooks of all skill levels. 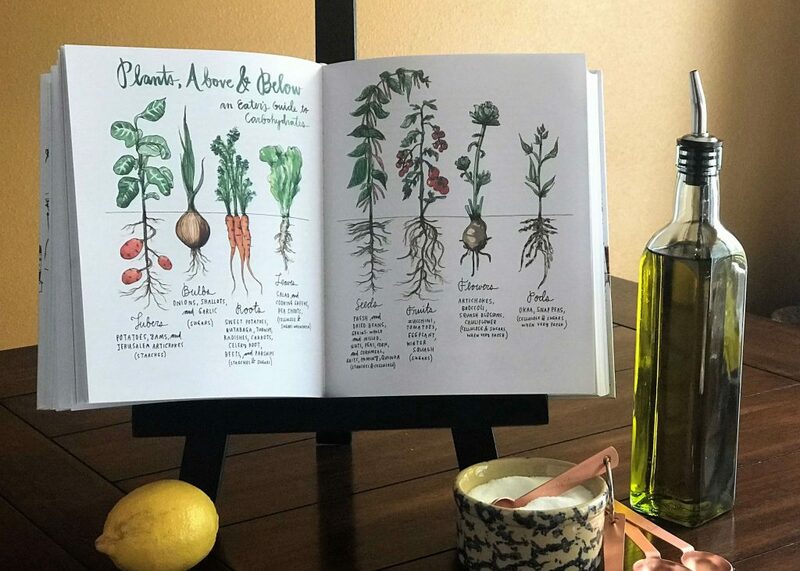 After mentioning several times the role of fresh herbs in the foodie scene, I want to share with you a beautiful gift idea that a good friend and fellow blogger posted on her site (Root and Bloom Forever): the DIY Herb Garden Starter Kit. 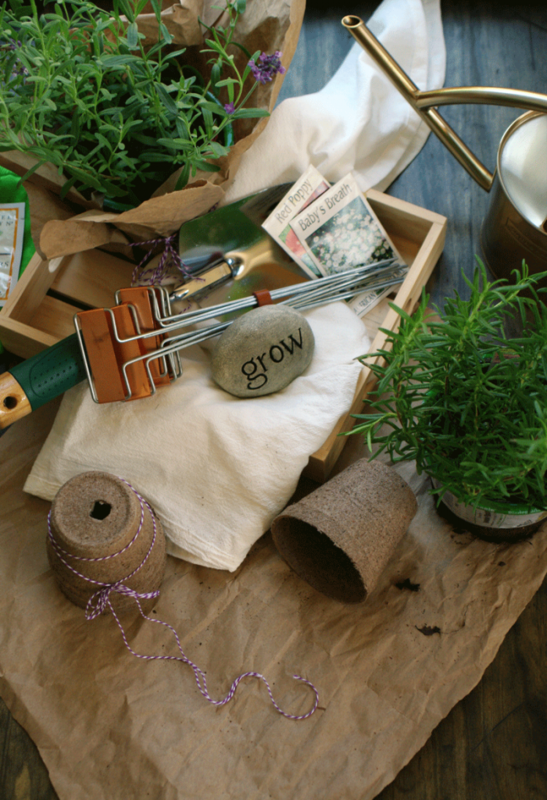 Mary combines fresh herb plants, plant markers, gardening gloves, a trowel and pruning shears, seed packets, and other related items, all nestled in a pretty wicker basket or crate. 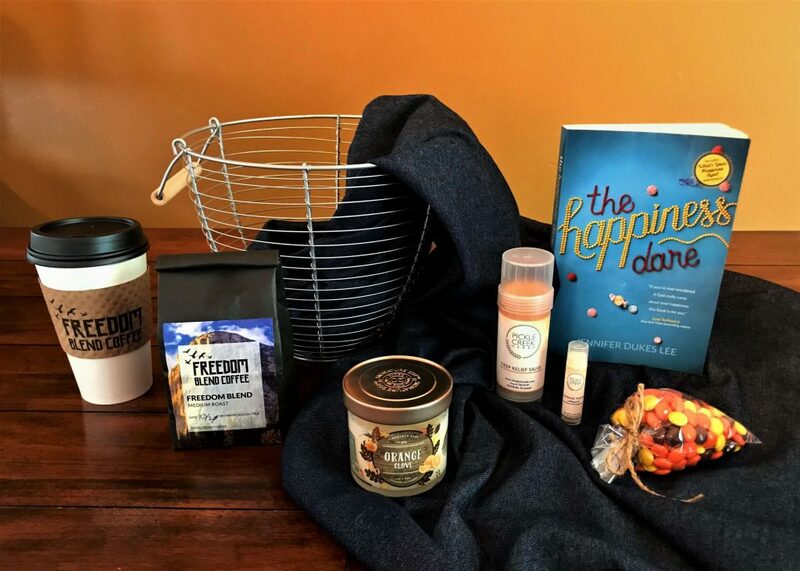 IDEA: When you put this smile-inducing basket together, make sure you add a tag with the website to Root and Bloom Forever so they too can benefit from the inspiring, motivating, and creative information she shares! Remember when I said the orange and clove combination was making a comeback? These Sugar and Spice Pecans are proof. I have made these pecans over and over again since my friend, Lori (the same “good friend” who gave me the book The Happiness Dare mentioned earlier … she’s a great source of all things awesome! ), gave me the recipe. 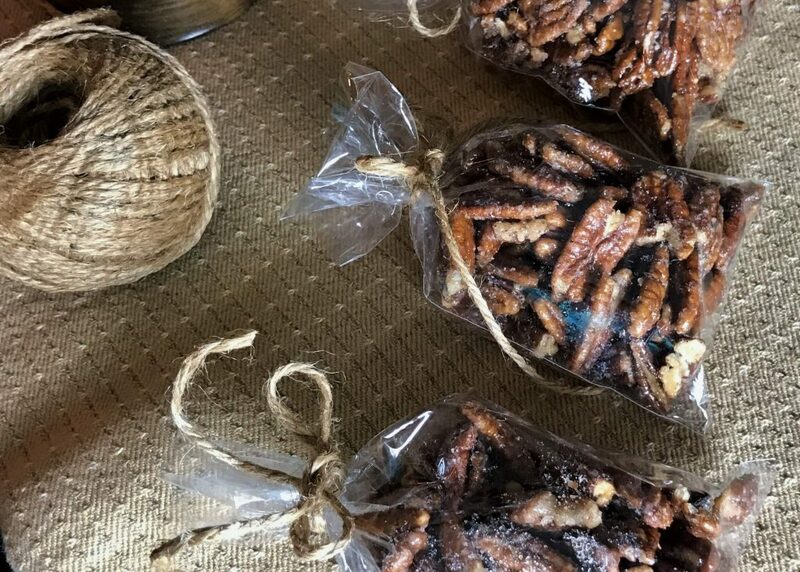 Every single time I give these as a party favor in clear cellophane bags tied with twine, I am asked the same question … “are these hard to make?” The answer is “no”! They are easy and are as delicious in the summer on a spinach salad with strawberries as they are in the winter on a charcuterie platter or as a topping to sweet potato casserole. That is, if you don’t just eat them all right out of the bag. My gift to you: the recipe! If you’re taking the time to pick out a perfect gift for a foodie, why not wrap it appropriately? Look closely. This package is wrapped in a paper grocery bag from Trader Joe’s. 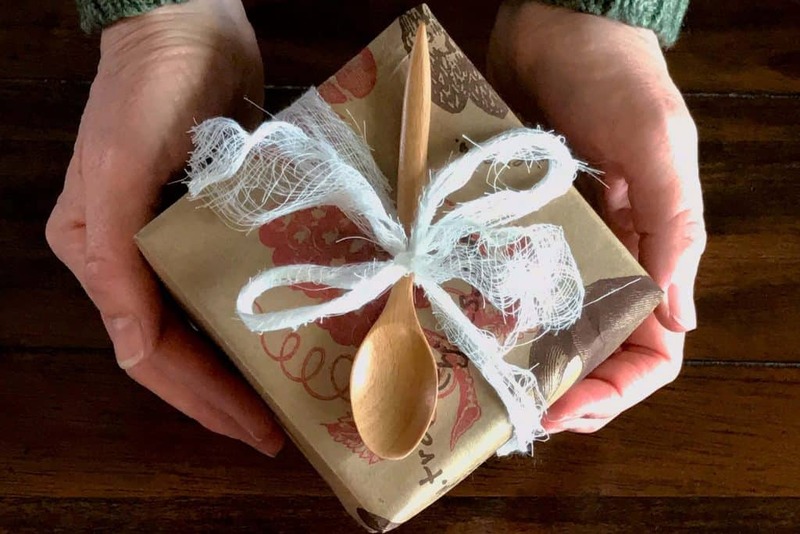 It is tied with a strip of cheesecloth and a bonus adornment gift of a small wooden serving spoon. I will often wrap gifts with the unmarked side of paper grocery bags but as I grabbed this bag, I realized these Trader Joe’s bags are beautiful! Why wouldn’t I use the pictures of fruit and vegetables to wrap a foodie gift? Other foodie wrapping inspiration? Aluminum foil … cheesecloth … parchment paper … think outside the box (pun intended). Need a last minute filler for a basket or box? Run paper grocery bags through a shredder! Skip the ribbon and tie on a set of measuring spoons, a cheese knife, or accordion-fold a dish cloth into a bow. 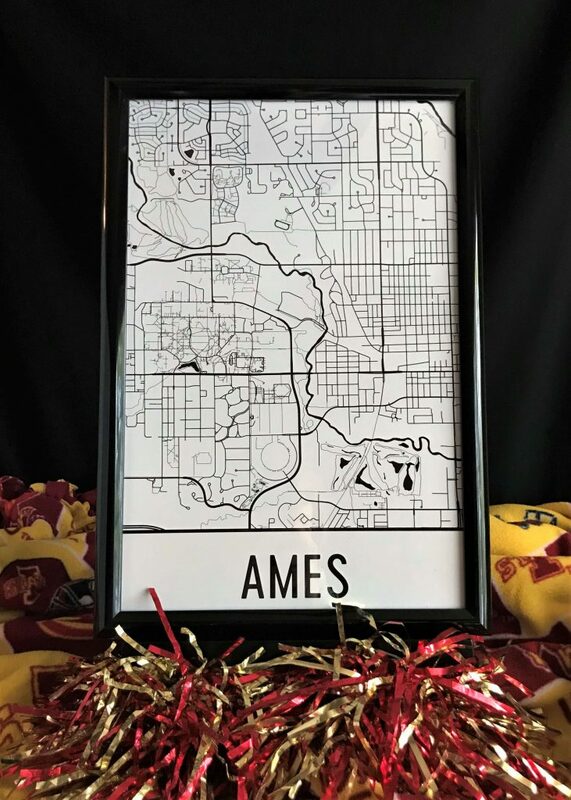 I want you to know that there is only one vendor on this list that approached me about featuring one of their products, and that was Modern Map Art with the Ames print. I was given the print in exchange for featuring it on one of my blogs. I agreed to this because I loved the item, it was a clear and stylish print, and I thought it was worth sharing with you. All of the other items were products that I found, use, and love. Some of these products were given to me at no cost when I told the vendor that I wanted to feature them in this post. Some of them I purchased on my own for this post. My purpose in starting a blog was and is to share good, positive, and useful information. I have no desire to be negative about anything. If I come across something I don’t like, I won’t share it. After all … sharing is the point of this post. NOTE: If you’d like a chance to win some of these great products, head over to and “like” my Facebook page. Over the next 3 weeks, I’ll be giving away an Iowa Foodie box, an Iowa State Foodie box, and a Foodie with a Cause box (details in Facebook posts). All my best to you! Happy Giving! Need some fresh ideas for the food-lover on your list? Find the perfect gift or inspiration for holiday, birthday, wedding, graduation gifts or party favors and hostess gifts! I love your blog! Keep them coming. I am one who needs inspiration in the food department… especially now with the holidays approaching.